Just when we are stressing over the scary hospital bill… Good news are announced. Initially we are entitled for SGD$6000 of baby bonus for our first “Singapore citizen baby” as this is the amount of baby bonus given by Singapore government for the first and second Singapore citizen kids born on or after 26 August 2012… But thanks for the General Election which is coming “soon”, our PM Lee gave a national rally last weekend which announced more support for Parents to give birth to Singapore babie. All Jubilees babies and those who born beyond the Jubilee year (those who are born on 1st Jan 2015 onwards), will received an extra S$2,000 in Baby Bonus and an additional S$1,000 in Medisave grants. 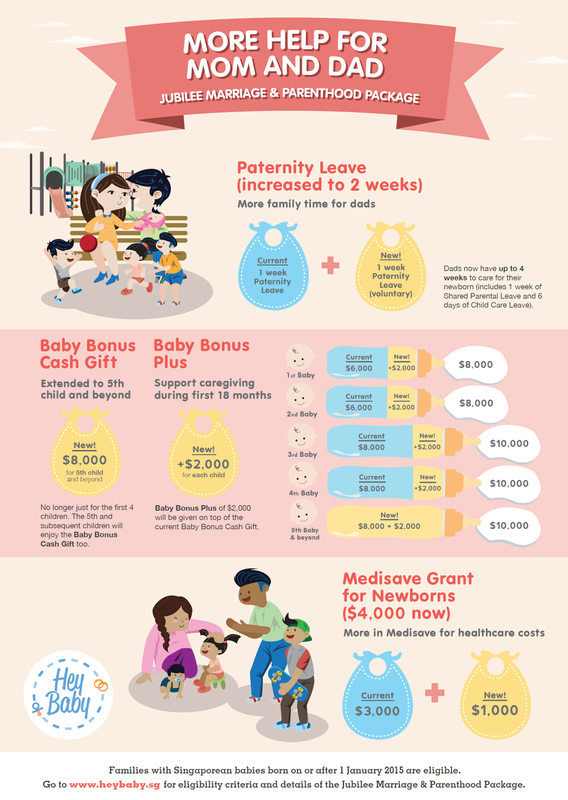 This means that for the first and second Singapore citizen child of the family, the kid will entitled SGD$8000 of Baby bonus in cash, and SGD$4000 of Medisave! With the increasing of hospital bill and medical expenses for the delivery of a baby, this amount will come in real handy in helping the parents on paying their bills (conditioned that the hospitals and clinics do not take this chance to UP the bills for all related charges, like how the childcare center “sabotage” the childcare grant).